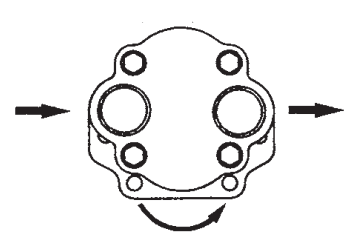 Gear pumps have an input shaft that drives an inner gear or “drive” gear. When the shaft turns the drive gear, the drive gear turns the “driven” gear. 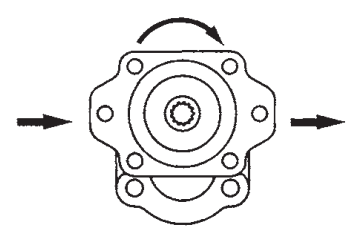 As these two gears rotate, oil is pulled into the suction port, split and carried around the perimeter of the gears, and finally, combined and pushed out the discharge port. 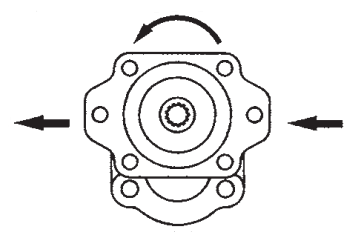 When determining the rotation of a gear pump, one must decide on the viewing orientation. 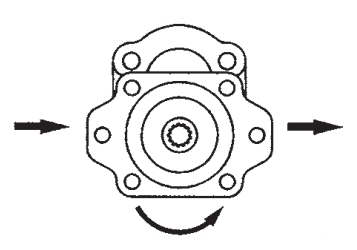 As an industry standard a pump’s rotation is determined when viewed looking at the input shaft. If your viewing orientation is at the rear of the pump, the technical rotation of the pump is opposite the visual rotation. 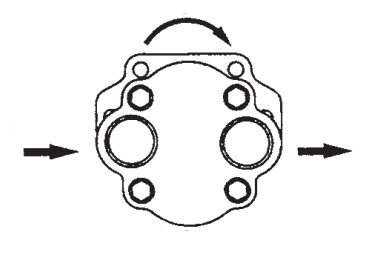 The suction and discharge ports are determined by the rotation of the input shaft. As with rotation, the position of each port is dependent upon the viewing orientation. Here to, the industry standard, when looking at the input shaft, is for the drive gear to be oriented above the driven gear, also known as “belly down”. 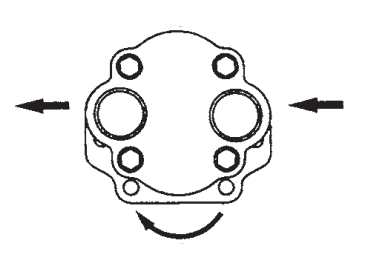 In this orientation, a clockwise pump will have suction on the left and discharge on the right and vice versa. If the pump is oriented with the “belly up”, the suction and discharge ports will appear opposite. 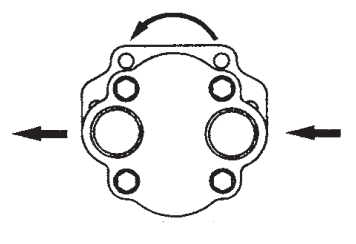 In the chart below, direction of oil flow is represented by straight arrows and the rotation of the pump is indicated with an arced arrow. 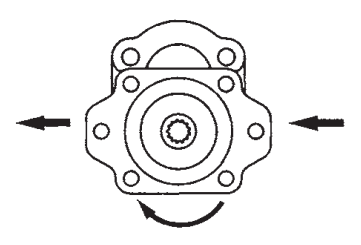 Viewing Pump with Input Shaft above Driven Gear “Belly Down"
Viewing Pump with Input Shaft above Driven Gear “Belly Up"